The open-air market in Gruz is a vibrant, busy market where everyone comes to buy fresh ingredients for today's lunch or dinner. Gruz market is mainly known as a fish market, where you can buy fresh fish that just came in from the sea, off the fishing boats. If you are staying in Dubrovnik for a few days in an apartment, take a walk in the morning to Gruz market, buy some fresh fish, shrimps, squids or an octopus and go for a great dinner! While you are there, fresh seasonal vegetables from local farmers are also available. While there are parking spots in a vicinity, don't get your hopes up, taking a walk or a local bus is a much better choice! Gruz market has been completely renovated in 2013 and is now up to the highest standards. Fish is no longer sold in plastic crates, but will be sold on the ice, which meets the European standards. It now also has the facilities for washing and cleaning the fish. Some stands already open around 6:30 in the morning, but most off the just before 8:00 o'clock when the locals start /shopping/. In the summer the working hours are longer, approximately until 15:00 with the flower stands working even later. Of course, the earlier you get there, the better. Friday and Saturday are usually the most busy days on the market. 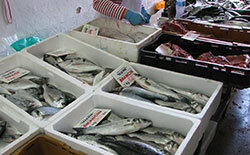 On Friday, everyone buys fish, therefore the selection is the best, and Saturday is traditionally a market day.